Yin Tang Dance has been in Cleveland since 1999. Originally a dance instructor at the CCCCA, Yin Tang separated to form the performance focused company in 2013. The dancers perform styles centered around historical songs, legends and different regions of China. Each region holds deep cultural roots and are unique in their own way. 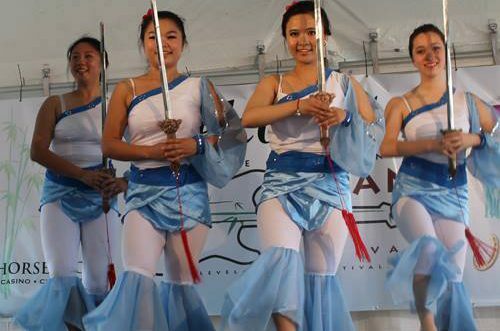 Yin Tang Dance does not only bring a colorful show, but a cultural experience as well. About Yin Tang: Cleveland’s premier Chinese choreographer, she began learning dance at the age of three from her mother who was professionally trained in Classical Chinese dance. In her high school and early college days, she traveled to China over the summers and continued dancing with instructors from professional schools in Chongqing. Yin has also trained in classical and romantic ballet to further her technique. She has taught at the CCCCA (cccca.org) since 1999 and left in 2013 to form her own company. Some other schools she has taught for include: Chinese Academy of Cleveland (Shaker Hts, OH), Families with Children from China (Akron, OH), Chinese Culture Club (Euclid, OH), and workshops for the University of Akron. Her studio is located in the Asian Services in Action office at 3631 Perkins Ave, Cleveland, OH. Hello, My name is Normaris Mendoza and I am the ESL Tutor at St. Wendelin Catholic School in Fostoria, Ohio. Currently I have fifteen international students from China who have chosen to study at our school. I believe that in order to be overall successful it is important to not only learn the American culture and language, but for the Chinese students to give our American students a look into their culture. Therefore I am trying to plan a Chinese New Year event at St. Wendelin School in Febuary. With that said is there a possibility of having some of your students perform at the school in honor of the Chinese New Year festivities? Please feel free to either email me at normaris.mendoza@stwendelin.org or I can be reach at (419) 435-8144. Thank you, and I look forward to hearing from you soon! Espero ustedes me envíen mayor información sobre sus danzas, sus leyendas, sus historias;es reconfortante poder aprender más de una cultura milenaria y hacerlas conocer a los jóvenes. Dónde poder adquir sus músicas. Gracias por su atención. Good man! Please note nice offers for you.